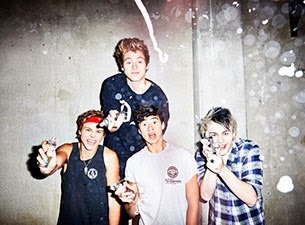 5 Seconds Of Summer have finished writing their new album. The Aussie pop-rock quintet confirmed on Alex Gaskarth and Jack Barakat of All Time Low's Full Frontal radio show their sophomore album is written, almost fully recorded and they have just a few more things to do before they plan on releasing the first single from it. The band also revealed that one song that made the album was co-written by Alex, which he wasn't aware of until now! 5 Seconds Of Summer are currently touring the world on their highly-anticipated "Rock Out With Your Socks Out" tour. Remaining dates and ticket information can be found here.